If Teheran manages to agree with Brussels, gas for the “Nabucco” pipeline could flow from Iran to the EU, comments Armenian analyst Armen Hanbabian for Deutsche Welle. Today the Iran-Armenia pipeline has a regional importance and is in a way an alternative to the supplies of Russian gas by the pipeline via Georgia. But the Iran-Armenian pipeline could also transport “blue fuel” from Iran to European countries. Moreover, if Teheran manages to agree with the European countries, then gas for the “Nabucco” pipeline could flow from Iran, considers the expert Armen Hanbabian. Yerevan still views as mistake that the pipeline Baku-Tbilisi-Ceyhan, that transports oil from Caspian Sea through Georgia into Turkish port, goes around Armenia. This circle costs investors several hundreds million dollars. Turkey and Azerbaijan could also save on construction of railway line connecting Turkish Kars with Georgian Akhalkalaki and Baku, although close there is an existing way Kars – Armenian city Gyumri-Tbilisi. The reason for these wastes is a political one. 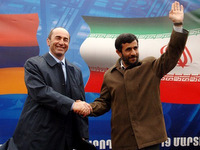 As the current state of war between Armenia and Azerbaijan impedes the cooperation of these two countries, the same due to the confrontations of Teheran with international community Armenia can’t use its transit “card”, and particularly already existing gas pipeline Iran-Armenia. Armenian analyst Armen Hanbabian assumes, that the situation will change already by 2010, when most probably Ankara and Yerevan establish diplomatic relations, and the situation around Karabakh conflict settlement will improve. However, according to his comments, it’s not enough. Firstly, it’s important for Azerbaijan and Armenia to establish normal interrelations, considers the expert. 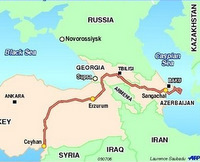 As he supposes, only in this case the pipe of the prospective gas pipeline “Nabucco” that will transport gas from Central Asia and Azerbaijan to Europe through Georgia and Turkey, can go through Armenia as a branch. “Except for that it’s urgent to wait for the improvement of Armenian-Turkish relations, that is now predictable, - continues Armen Hanbabian. - Naturally, a part of the pipeline can be laid also through Iran. However, it demands the improvement of relations between Teheran and West. That is why there is a chance for Armenia to gain a status of a transit state, but at the moment this chance is not that high". Today the gas pipeline Iran-Armenia is of regional importance and in a way is an alternative to Russian gas supplies through Georgian territory. But the Iran-Armenian pipeline could also transport “blue fuel” from Iran to European countries. Moreover, provided Teheran manages to agree with the European Union, then gas for the “Nabucco” pipeline could flow from Iran. Meanwhile this project includes supplies of energy carriers from Azerbaijan and Central Asian states, but Teheran has already specified its willingness to fill the pipe only with its own gas. Thus, in theory “Nabucco” could start in Iran. According to Armen Hanbabian to enhance the status of the gas pipeline Iran-Armenia, “firstly, it should be extended by laying at least one more parallel pipe close to the existing one. And, secondly, Russia should approve it, as the pipeline in its Armenian part is a property of “Gazprom”. That is why, if a political decision of Russian party to become shareholders of the future gas pipeline is made, this will be pretty likely ". However, still Russian participation in “Nabucco” is out of the question. 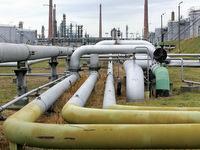 This confronts with the plans of Europeans, interested in reduction of dependence from Russian energy carriers supplies. In addition, Moscow is engaged at the moment with the issues of its own gas pipeline construction – “South Stream” that will transport “blue fuel” to the countries of South Europe and Caspian region. It would carry gas to Europe from Central Asia through Russian territory. And this is definitely an alternative to the “Nabucco” gas pipeline project.